Waterhog ECO Berber Mats offer a hobnail pattern, which aggressively scrapes grit, grime and moisture off shoes. 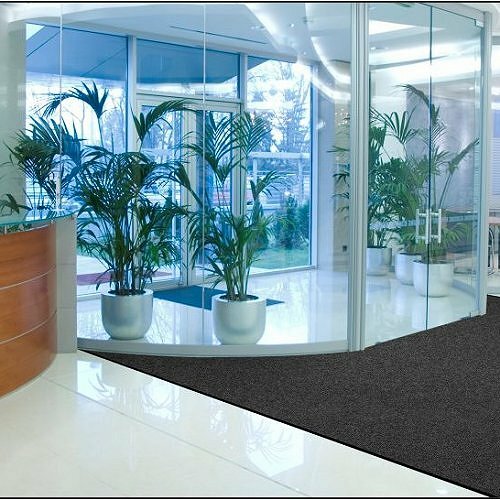 The surface of these Waterhog Berber entrance mats is made with an anti-static polypropylene material that quickly dries and will not fade nor rot, making it a perfect ECO floor mat for indoor or outdoor areas. • Waterhog eco berber mats have a crush-resistant surface for maximum mat performance & prolonged appearance. • Versatile eco berber "roll good" construction allows for flexibility; great for large entrance areas and custom cuts. • Easily clean these waterhog berber mats: simply vacuum, use extraction cleaning methods, or hose off and hang dry.